The Charter is deposited with the government of the United States. 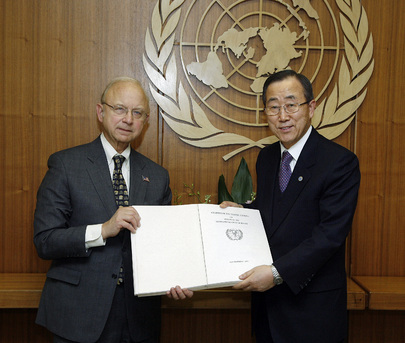 A certified true copy was presented to Secretary-General Ban Ki-Moon on 2 January 2008 by Allen Weinstein of the United States National Archives. The Library holds a collection of translations of the UN Charter into various languages. Full text of the Charter in one searchable webpage. Also available in French. The United States is the depositary of the UN Charter, in accordance with article 111 of the Charter. Digital version of a certified true copy of the Charter in all authentic languages. Signatures begin on page 165 of the pdf. Current status of the Charter and the Statute of the International Court of Justice, with declarations and amendments. Links to Certified True Copies in authentic languages. The Charter of the United Nations on the UN website, organized by chapter, with an introduction that explains the amendments to the text. 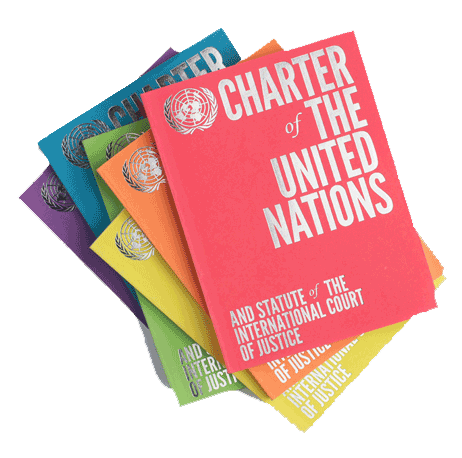 Links to the text of the Charter in other official UN languages.